A basic income (also called basic income guarantee, citizen's income, unconditional basic income, universal basic income (UBI), basic living stipend (BLS) or universal demogrant) is typically described as a new kind of welfare regime in which all citizens (or permanent residents) of a country receive a regular, liveable and unconditional sum of money, from the government. From that follows, among other things, that there is no state requirement to work or to look for work in such a society. The payment is also, in such a pure basic income, totally independent of any other income. 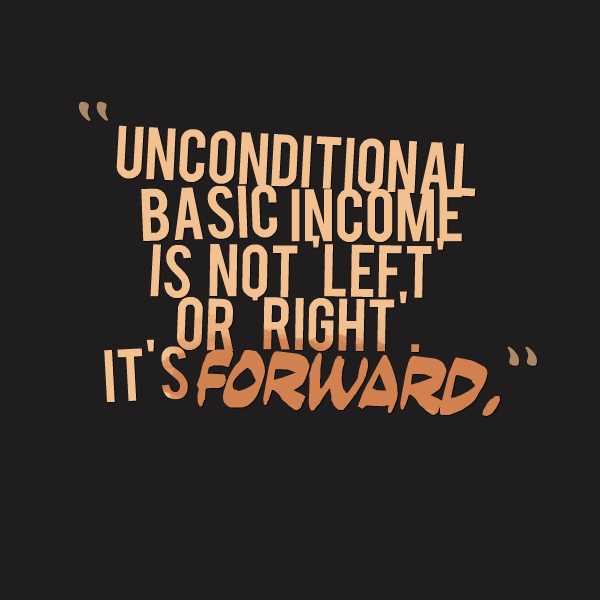 An unconditional income that is sufficient to meet a person's basic needs (at or above the poverty line), is called full basic income, while if it is less than that amount, it is called partial. Basic income can be implemented nationally, regionally or locally. Some welfare systems are related to basic income but have certain conditions. For example, Bolsa Família in Brasil is restricted to poor families and the children are obligated to attend school. A related welfare system is negative income tax. Like basic income, it guarantees everyone (where everyone can mean, for example, all adult citizens of a country) a certain amount of regular income; but with negative income tax, the amount a citizen receives depends on his or her income from labor. That is not the case with a pure and flat basic income, where everyone (for example every adult citizen) gets the same amount. 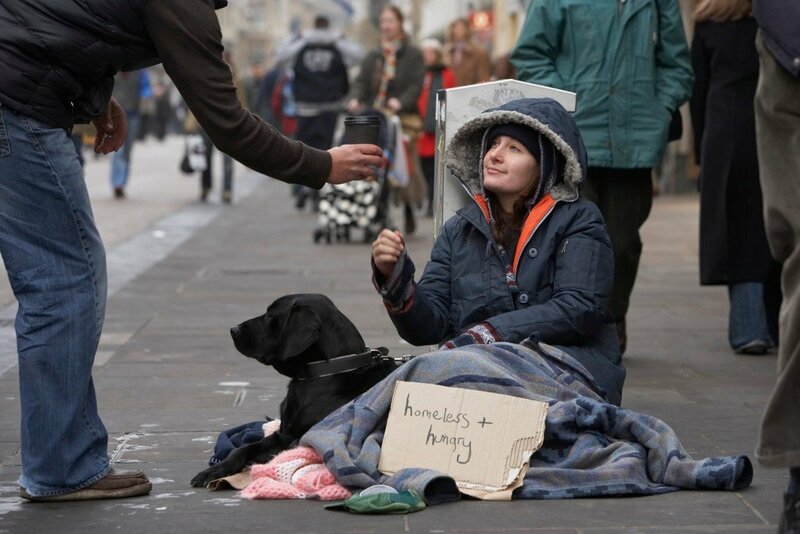 The minimum income, the idea to eradicate poverty by targeting the poor, is in contradiction with basic income given "to all", but nevertheless share some underlying ideas about the state's or the city's welfare responsibilities towards its citizens. Johannes Ludovicus Vives (1492–1540), for example, proposed that the municipal government should be responsible for securing a subsistence minimum to all its residents, "not on grounds of justice but for the sake of a more effective exercise of morally required charity". However, to be entitled poor relief the person’s poverty must not, he argued, be undeserved, but he or she must "deserve the help he gets by proving his willingness to work." The first to develop the idea of a social insurance was Marquis de Condorcet (1743–1794). After playing a prominent role in the French Revolution, he was imprisoned and sentenced to death. While in prison, he wrote the Esquisse d’un tableau historique des progrès de l’esprit humain (published posthumously by his widow in 1795), whose last chapter described his vision of a social insurance and how it could reduce inequality, insecurity and poverty. Condorcet mentioned, very briefly, the idea of a benefit to all children old enough to start working by themselves and to start up a family of their own. He is not known to have said or written anything else on this proposal, but his close friend and fellow member of the Convention Thomas Paine (1737–1809) developed the idea much further, a couple of years after Condorcet’s death. The idea of a state-run basic income dates back to the late 18th century when English radical Thomas Spence and American revolutionary Thomas Paine both declared their support for a welfare system in which all citizens were guaranteed a certain income. In the 19th century and until the 1960s the debate on basic income was limited, but in the 1960s and 1970s the United States and Canada conducted several experiments with negative income taxation, a related welfare system. From the 1980s and onwards the debate in Europe took off more broadly and since then it has expanded to many countries around the world. A few countries have implemented large-scale welfare systems that are related to basic income, such as the Permanent Fund in Alaska and Bolsa Família in Brasil. From 2008 and onwards there has also been several experiments with basic income and related systems. Especially in countries with an existing welfare state a part of the funding assumably comes from replacing the current welfare arrangements, or a part of it, such as different grants for unemployed people. Apart from that there are several ideas and proposals regarding the rest of the financing, as well as different ideas about the level and other aspects. WHO - Work-related stress : scientific evidence-base of risk factors, prevention and cost Work-related stress is still an evasive concept to many, although the topic is covered in hundreds of papers published every year. The seminar will focus on the main evidence of risk factors extracted from existing research, as concerns in particular work-related stress interventions and related costs. The first social movement for basic income developed around 1920 in the United Kingdom. Its proponents included Bertrand Russell, Dennis Milner (with wife) and Clifford H. Douglas. Bertrand Russell (1872–1970) argued for a new social model that combined the advantages of socialism and anarchism, and that basic income should be a vital component in that new society. Dennis Milner, a Quaker and a Labour Party member, published jointly with his wife Mabel, a short pamphlet entitled “Scheme for a State Bonus” (1918). There they argued for the "introduction of an income paid unconditionally on a weekly basis to all citizens of the United Kingdom". They considered it a moral right for everyone to have the means to subsistence, and thus it should not be conditional on work or willingness to work. Clifford H. Douglas was an engineer who became concerned that most British citizens could not afford to buy the goods that were produced, despite the rising productivity in British industry. His solution to this paradox was a new social system called "social credit", a combination of monetary reform and basic income. In 1944 and 1945, the Beveridge Committee, led by the British economist William Beveridge, developed a proposal for a comprehensive new welfare system of social insurance and selective grants. Committee member Lady Rhys-Williams argued for basic income. She was also the first to develop the negative income tax model. In the 1960s and 1970s, there were a welfare debates in United States and Canada which included basic income. Six pilot projects were also conducted with negative income tax. Then US president Richard Nixon once even proposed a negative income tax in a bill to the US Congress. But the Congress eventually only approved a guaranteed income for the elderly and the disabled, not for all citizens. In the late 1970s and the 1980s, basic income was more or less forgotten in the United States, but on the other hand it started to gain some attraction in Europe. Basic Income European Network, later renamed to Basic Income Earth Network, was founded in 1986 and started to arrange international conferences every two years. From the 1980s, some people outside party politics and universities took interest. In West Germany, groups of unemployed people took a stance for the reform. From 2005–2010 and onwards, basic income again became a hot topic in many countries. Basic income is nowaday discussed from a variety of perspectives. But not least in the context of ongoing automation and robotisation, often with the argument that these trends will mean less paid work in the future, which in turn would create a need for a new welfare model. 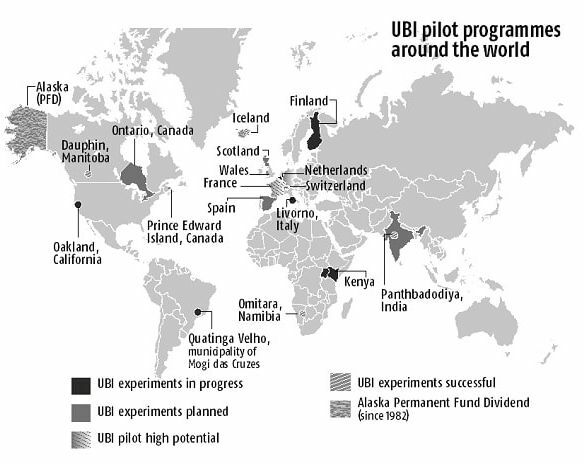 Several countries are planning for local or regional experiments with basic income and/or related welfare systems. The experiments in India, Finland and Canada, for example, have received international media attention. There has also been several polls about basic income, investigating the public support for the idea in different countries, and in 2016 a basic income proposal was rejected in Switzerland by 73% of the voters in a national referendum. Basic income is potentially a much simpler and more transparent welfare system than existing in the welfare states today. Instead of separate welfare programs (including unemployment insurance, child support, pensions, disability, housing support) it could be one income, or it could be a basic payment that welfare programs could add to. This could require less paperwork and bureaucracy to check eligibility. The lack of means test or similar bureaucracy would allow for saving on social welfare, which could be put towards the grant. The Basic Income Earth Network (BIEN) claims that basic income costs less than current means-tested social welfare benefits, and has proposed an implementation that it claims to be financially viable. However, other proponents argue for adding basic income to existing welfare grants, rather than replacing them. Advocates of basic income often argue that it has a potential to reduce or even eradicate poverty. Several advocates of basic income have argued that basic income promotes freedom. Right-leaning supporters have argued that policies like basic income free welfare recipients from the paternalistic oversight of conditional welfare-state policies. Philippe Van Parijs has argued that basic income at the highest sustainable level is needed to support real freedom, or the freedom to do whatever one "might want to do". By this, Van Parijs means that all people should be free to use the resources of the Earth and the "external assets" people make out of them to do whatever they want. Money is like an access ticket to use those resources, and so to make people equally free to do what they want with world assets, the government should give each individual as many such access tickets as possible—that is, the highest sustainable basic income. If some other group of people controls resources necessary to an individual's survival, that individual has no reasonable choice other than to do whatever the resource-controlling group demands. Before the establishment of governments and landlords, individuals had direct access to the resources they needed to survive. But today, resources necessary to the production of food, shelter, and clothing have been privatized in such a way that some have gotten a share and others have not. Therefore, this argument goes, the owners of those resources owe compensation back to non-owners, sufficient at least for them to purchase the resources or goods necessary to sustain their basic needs. This redistribution must be unconditional because people can consider themselves free only if they are not forced to spend all their time doing the bidding of others simply to provide basic necessities to themselves and their families. Under this argument, personal, political, and religious freedom are worth little without the power to say no. In this view, basic income provides an economic freedom, which—combined with political freedom, freedom of belief, and personal freedom—establish each individual's status as a free person. One argument against basic income is that if people have free and unconditional money, they will "get lazy" and not work as much as before. Less work means less tax revenue, argue critics, and hence less money for the state and cities to fund public projects. If there is a disincentive to employment because of basic income, it is however expected that the magnitude of such a disincentive would depend on how generous the basic income were to be. There have been some studies around the employment levels during the experiments with basic income and negative income tax, and similar systems. In the negative income tax-experiments in United States in the 1970s, for example, there were a five percent decline in the hours worked. The work reduction was largest for second earners in two-earner households and weakest for the main earner. It was also a higher reduction in hours working when the benefit was higher. The participants in these experiments, however, knew that the experiment was limited in time. In the Mincome experiment in rural Dauphin, Manitoba, also in the 1970s, there were also a slight reduction in hours worked during the experiment. However, the only two groups who worked significantly less were new mothers and teenagers working to support their families. New mothers spent this time with their infant children, and working teenagers put significant additional time into their schooling. Under Mincome, "the reduction of work effort was modest: about one per cent for men, three per cent for wives, and five per cent for unmarried women." Another study that contradicted such decline in work incentive was a pilot project implemented in 2008 and 2009 in the Namibian village of Omitara; the assessment of the project after its conclusion found that economic activity actually increased, particularly through the launch of small businesses, and reinforcement of the local market by increasing households' buying power. However, the residents of Omitara were described as suffering "dehumanising levels of poverty" before the introduction of the pilot, and as such the project's relevance to potential implementations in developed economies is unknown. James Meade states that a return to full employment can only be achieved if, among other things, workers offer their services at a low enough price that the required wage for unskilled labor would be too low to generate a socially desirable distribution of income. He therefore concludes that a "citizen's income" is necessary to achieve full employment without suffering stagnant or negative growth in wages. If there is a disincentive to employment because of basic income, it is however expected that the magnitude of such a disincentive would depend on how generous the basic income were to be. Some campaigners in Switzerland have suggested a level that would only just be liveable, arguing that people would want to supplement it. Tim Worstall, a writer, blogger and Senior Fellow of the Adam Smith Institute, has argued that traditional welfare schemes create a disincentive to work, because such schemes typically cause people to lose benefits at around the same rate that their income rises (a form of welfare trap where the marginal tax rate is 100 percent). He has asserted that this particular disincentive is not a property shared by basic income, as the rate of increase is positive at all incomes. Fox Piven argues that an income guarantee would benefit all workers by liberating them from the anxiety that results from the "tyranny of wage slavery" and provide opportunities for people to pursue different occupations and develop untapped potentials for creativity. Gorz saw basic income as a necessary adaptation to the increasing automation of work, but also a way to overcome the alienation in work and life and to increase the amount of leisure time. The debates about basic income and automation are closely linked. For example, Mark Zuckerberg argues that automation will take away many jobs in coming years, and that basic income is especially needed because of that. Concerns about automation have prompted many in the high-technology industry to argue for basic income as an implication of their business models. Many technologists believe that automation (among other things) is creating technological unemployment. Journalist Nathan Schneider first highlighted the turn of the "tech elite" to these ideas with an article in Vice magazine, which cited Marc Andreessen, Sam Altman, Peter Diamandis, and others. Some studies about automation and jobs validate these concerns. The US White House, in a report to the US Congress, estimated that a worker earning less than $20 an hour in 2010 will eventually lose their job to a machine with 83% probability. Even workers earning as much as $40 an hour faced a probability of 31%. With a rising unemployment rate, poor communities will become more impoverished worldwide. Proponents of universal basic income argue that it could solve many world problems like high work stress, and provide more opportunities and efficient and effective work. This claim is supported by some studies. In a study in Dauphin, Manitoba, only 13% of labor decreased from a much higher expected number. In a study in several Indian villages, basic income in the region raised the education rate of young people by 25%. Besides technological unemployment, some tech-industry experts worry that automation will destabilize the labor market or increase economic inequality. One is example, Chris Hughes, co-founder of both Facebook and Economic Security Project. Automation has been happening for hundreds of years; it has not permanently reduced the employment rate but has constantly caused employment instability. It displaces workers who spend their lives learning skills that become outmoded and forces them into unskilled labor. Paul Vallée, a Canadian tech-entrepreneur and CEO of Pythian, argues that automation is at least as likely to increase poverty and reduce social mobility than it is to create ever-increasing unemployment rate. At the 2016 North American Basic Income Guarantee Congress in Winnipeg, Vallée examined slavery as a historical example of a period in which capital (African slaves) could do the same things that human labor (poor whites) could do. He found that slavery did not cause massive unemployment among poor whites, but instead increased economic inequality and lowered social mobility. Some proponents have argued that basic income can increase economic growth because it would sustain people while they invest in education to get interesting and well-paid jobs. However, there is also a discussion of basic income within the degrowth movement, which argues against economic growth. The Permanent Fund of Alaska in the United States provides a kind of basic income, based on the oil and gas revenues of the state, to (nearly) all state residents. During her 2016 presidential campaign, former U.S. Secretary of State Hillary Clinton, along with her husband, considered including a policy similar to the Alaska Permanent Fund called "Alaska for America" as part of their platform after reading Peter Barnes book on the subject With Liberty and Dividends for All. Ultimately, the Clintons decided not to, with Hillary stating in her 2016 election memoir What Happened, "Unfortunately, we couldn't make the numbers work." However, in retrospect Clinton also said, "I wonder now whether we should have thrown caution to the wind and embraced 'Alaska for America' as a long-term goal and figured out the details later", considering that former Republican U.S. Treasury Secretaries James Baker and Henry Paulson have also proposed a similar nationwide policy. Bolsa Família is a big social welfare program in Brazil that provides money to many poor families in the country. The system is related to basic income, but also has some differences. Ontario, Canada was to implement a basic income trial in summer 2017. The Finnish government implemented a two-year pilot in January 2017 involving 2,000 subjects - report. 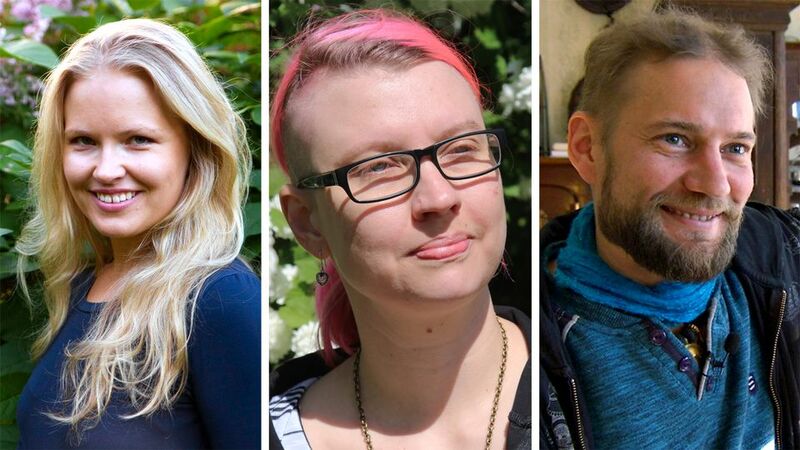 Finnish citizens given universal basic income report lower stress levels and greater incentive to workParticipants receive €560 (£473) every month for two years and do not have to demonstrate that they are actively seeking work.